Since the late nineteenth century, the “cost of living” has been a prominent part of debates about American political economy. By the early twentieth century, that prominence had taken a quantitative turn, as businessmen, unions, economists, and politicians all turned to cost-of-living statistics in their struggle to control and reshape the American economy. Today, the continuing power of these statistics is exemplified by the U.S Consumer Price Index, whose fluctuations have enormous consequences for economic policy and the federal budget (including the allocation of hundreds of billions of dollars annually through cost-of-living escalator clauses in programs such as Social Security). 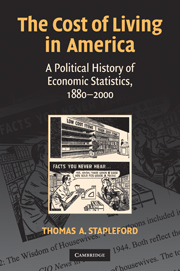 In this book, Stapleford interweaves economic theory with political history to create a novel account of the quantitative knowledge that underpins much of American political economy. Demonstrating that statistical calculations inevitably require political judgments, he reveals what choices were made in constructing and using cost-of-living statistics and why those choices matter both for our understanding of American history and for contemporary political and economic life.